Two Models to help improve and maintain your pool water quality. Scroll down to browse through information on 2 models of Solar-Powered Pool Ionizers/Purifiers/Mineralizers, for all types of pools, as large as 32,000 gallons. These products help control algae and greatly reduce chlorine usage. The Website Store Directory contains an alphabetized listing of all products for sale. We don't just sell products. We help you make a better-informed choice, by providing all the information, you might require. Need ordering help? Scroll down the page, for the Order Desk Telephone Help Number. All items ordered will end up in the same shopping cart, no matter which page of this website, the items are located. All Major Credit Cards and PayPal are accepted. Order one today. The Dual-Ions help produce better water quality. These Solar-Powered Dual Ion Ionizers/Purifiers/Mineralizers employ a natural technology, that has been used since antiquity. Simply place the Mineralizer in the pool and naturally occurring minerals, are slowly released into the pool water, using the Sun’s solar energy. Sunlight is converted, by the solar cells, into a low voltage current, that slowly dissolves a sacrificial anode beneath the pool water surface. The Dual-Ions, copper and zinc, retard the growth of algae and other microorganisms, resulting in a significant reduction in the usage of oxidizers, chlorine or bromine, that is required to help keep your pool crystal-clear, clean and healthy. For best results, keep the pH at 7.2-7.6 and favor the lower end, especially, in hard water areas. Monitor the copper level and keep it under 1.0 PPM. A maximum level of 0.3 PPM would be ideal. Made from high-tech plastic components and other well-designed materials. The Solar Clear Model features a foam-filled, unsinkable floating body. The photovoltaic, Solar Cell faces upwards, as the unit floats and the anode remain submerged. Both models feature a larger anode, that provides seasons of performance, before the anode has to be replaced. Compatible with all types of pool sanitizers, with the exception of biguanide. A free package of tests strips is included, to help you maintain the proper chemistry. Choose from two attractive, modern designs. ● These Solar-Powered Pool Mineralizers help reduce your Chlorine or Bromine usage, by as much as 80%. ● Suitable for inground and above ground pools. ● Dual Ion Ionizer/Purifier/Mineralizer, uses copper and zinc, for improved performance. ● Works on the principle of Ionization, sanitizing with metallic ions. ● Features a larger metallic anode, for longer-lasting life. ● No Installation, Plumbing or Electrical Hookups are required. ● Works in all types of swimming pools, as large as 32,000 Gallons. ● Can be used, with all types of sanitizers, with the exception of biguanide. ● Environmentally friendly and Non-Toxic way to sanitize. ● Contributes no chemicals to the pool water, other than the ionized metals. ● The extra-large. metallic anodes should last 2-4 seasons and are replaceable. ● Multi-lingual Instructions: English, French and Spanish. ● Allows you to maintain a lower 1.0-1.5 PPM free chlorine level, instead of levels as high as 4 PPM. ● Slows the buildup of such byproducts as cyanuric acid and calcium hardness. ● Foam-filled, unsinkable body, in the SolarPur model. ● Unit dimensions: Diameter 12.5" x Height 7.25". Unit weight: 4.7 pounds. ● Shipping Weight: 5.3 pounds (2.4 kg.) Shipping size: 13" x 13" x 8". ● Includes a FREE package of test strips. ● One Year Limited Factory Warranty. Using with a Salt Chlorine Generator? When used with any new or existing salt chlorine generator, a Solar-Clear or SolarPur, Dual-Ion. Solar-Powered Ionizer/Purifier/Mineralizer will lengthen the life of the salt cell, by supplementing the sanitizing process. This means that the salt chlorine generator, does not have to generate as much chlorine, to maintain any given level, as would otherwise be required. Less chlorine having to be generated, will enable the salt cell to last longer. The pH will be easier to maintain, requiring smaller and less frequent additions of acid, because of the decreased need to generate chlorine. Maintaining a more optimized pH, make chlorine more effective and scale formation less likely. Using with conventional chlorine or bromine products? A Solar-Clear or SolarPur, Dual-Ion. Solar-Powered Ionizer/Purifier/Mineralizer will provide backup sanitation and will allow you to achieve satisfactory results, while maintaining chlorine or bromine levels, at about 1/2 of that usually recommended. You'll save money, by reducing chlorine or bromine usage and will slow down the build up of chemical byproducts such as, cyanuric acid, calcium hardness or dimethyl hydantoin. Water replacements will be fewer and separated, by greater intervals of time. Slows or reduces the rise in calcium hardness, making cloudy water or scaling less likely. Using with an Ozone Generator? Ozone is a very effective oxidizer and sanitizer, but leaves the water very quickly, after the pump is turned off. It may not last long enough to reach into the far corners of the pool. A Solar-Clear or SolarPur, Dual-Ion. Solar-Powered Ionizer/Purifier/Mineralizer will provide persistent sanitation, that extends throughout the pool. The combination of an Ozone Generator and Solar-Powered Ionizer/Purifier/Mineralizer enables you to only have to maintain very low levels of free chlorine. It can help you get close to chlorine-free!!! Using with an Ultraviolet (UV) Sterilizer? Ultraviolet Sterilizers kills just about everything, including seriously pathogenic microorganisms, present in the return flow. However, UV has no lasting, residual effect and does nothing to control microorganisms, in the pool water and on the walls. For this reason, a Solar-Clear or Solar Pur, Dual-Ion. 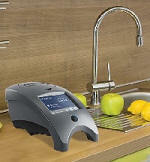 Solar-Powered Ionizer/Mineralizer provides the important benefit of adding persistent sanitizers. An oxidizer, such as chlorine or bromine is still required, to eliminate organic wastes and byproducts and aid in sanitation. However, the persistent sanitizing effect of the Solar-Powered Ionizer/Purifier/Mineralizer will supplement and greatly reduce the amount of chlorine or bromine required, to maintain any given level. It can help you come close to having a halogen-free pool. If your pool is scheduled to remain open and uncovered, during the less active off season, you might consider adding a solar-powered Pool Ionizer/Purifier. It will provide some sanitizing backup and help control algae, should the chlorine or bromine level bottom out. You'll still need chlorine, but it will reduce usage and make controlling the water quality easier and more effective. It will work for you all year long. The mineral anodes are sacrificial and are design to slowly dissolve, over extended periods of time. The average life of the oversized anodes are 18 - 30 months, depending on the actual conditions of use. Over time, the anode will dissolve away and replacement will be required. Upon visual inspection, when the anode narrows to about 1/4-inch (6 mm), it's time to consider a replacement anode. More value . . . lasts longer!!! Compared to other brands of Solar-Powered Purifiers/Ionizers/Mineralizers, Solar-Clear and SolarPur utilize an anode that is 18% larger, than the Leading National Brand. 489 grams versus 412 grams. This translates directly into longer life and lower costs. Upgrade the way you for test for Copper and other Pool Factors. Owner's #1 Choice with copper ionizers/purifiers. The ColorQ COPPER 5 Photometer is perfect for pool or spa owners and professionals, especially if are using a copper ionizer/purifier or have source water containing copper or iron. The ColorQ COPPER 5 Pool/Spa digital, photometer reads Five (5) Pool and Spa Test Factors: Copper (0 to 4.0 ppm, in 0.01 PPM increments), pH (6.5 to 8.5, in 0.1 increments), Alkalinity (0 to 250 ppm, in 1.0 PPM increments), Calcium Hardness (0 to 700 ppm), in 1.0 increments) and Iron (0 to 3.0, in 0.01 PPM increments). The kit features economical liquid reagents for pH, Alkalinity and Calcium Hardness: enough to do 144 tests for each test factor. Easy to use TesTabs® tablets for Copper (100 Tablets) and Iron (50 Tablets) are included. There is nothing else to buy, as all of the required supplies are provided. Factory Fresh Guaranteed. Pool and Spa News Readers' Choice Award for 2009. See the entire selection of 12 ColorQ models. For Contamination Metals, Stains, Sulfur, Phosphates and Odors. Detects and warns of potentially dangerous electrical shock hazards, in pools and spas.